This blog is a way for me to share many of my experiences from living on a farm in the middle of nowhere with people everywhere. Today the weather was absolutely gorgeous! A few of my friends and I decided to take a advantage of this and do a little swimming. We weren't exactly sure where we were going to swim, but we knew we wanted to. One idea was to do a Fountain Run. I know this isn't exactly swimming, but we would still be able to get wet and soak up some sun. Although this was a great idea, we decided to go another route. Luckily we knew some people who had a swimming pool and slip and slide set up. We were all very excited about this. Unfortunately we didn't end up getting there until about 7:30 p.m., and by that time, the temperature had cooled off quite a bit. The water used on the slip and slide was cold; however, the water in the pool was fairly warm. It at least felt warm compared to the slip and slide water anyway. Without much hesitation, we jumped into the pool. It was a lot of fun at first, but then the sun started going down and we started to get cold. We knew we would be much colder once we got out so we kept putting it off. Suddenly an idea came to mind. I saw the mud down at the end of the slip and slide and I thought it would be really fun to have a small mud fight. There were a few guys there, and I'm sure you know that guys are usually all for mud fights. Before we knew it, we were all headed to the mud. Once my friends and I got to the mud, we realized it was a little colder than we expected. We didn't really get a chance to change our minds because we were being picked up and thrown into the mud. Since we were already dirty, we decided we might as well get the guys that threw us in dirty too. A while back I blogged about 4-H. I gave a pretty basic explanation about 4-H and what it means to me, but I feel there is much more that I want to share. In my other blog about 4-H I didn't really go into much detail about the projects I took, and now looking back I realized it is something worth blogging about. As I mentioned before, I showed dairy cattle in 4-H. All cattle aren’t shown the same way. Beef cattle are actually shown quite different than dairy cattle. I can't tell you the real reason for this, but I can tell you how these two show practices are different. When showing dairy cattle, the showman leads the animal while walking backwards; however, the showman walks forward while showing beef cattle. Beef showmen also use a long stick when they show. I've never shown beef cattle so I'm not really sure why the stick is used, but I think it may be used to try to keep the animals calm. The showman stroke the animal’s stomach with the stick, and the stick can also be used to correct the animals feet if they aren't lined up just right. I always thought it would be hard to try to show a cow while holding a large stick, but beef people think it would be hard to show a cow while walking backwards. I guess it all depends on what you're used to. Dairy cattle are also groomed different than beef cattle. Beef showman spend hours washing, blow drying, painting, and sprayin g their cows hair. On the other hand, all that needs to be done with dairy steers is a good wash and let them air dry. Sometimes showman apply a little show sheen to a cloth and wipe their animals down. This makes the animal look sleek and shiny and it helps cover some flaws the animal might have. Showing dairy heifers or milk cows is a little more complicated than showing dairy steers, but it's still less work than grooming beef cattle. Judges for dairy heifers and cows are very strict on the way the animals hair is "styled". The basic guidelines of clipping diary heifers and cows can be found here. One of the best parts of showing cattle was getting money from selling them. I know this probably seems like it would be a little sad, but it got easier over time. The first time I had to sell my cow I wasn't really sure how I was going to handle the whole situation. I've grown up knowing that animals don't live forever, and I knew where my dad was taking cows once they got old. I even went with my dad to stalk yard to sell cows sometime. This time it was different because I had grown attached to my cow. When the time came to finally take my cow through the sale, I was extremely nervous. I surprised myself because I wasn't too sad. The only time I actually got upset was when I had to hand my cow off too the guys loading the stock trailer. When I saw my cow being led up the ramp I had to fight back the tears. My dad must have read my mind because he gave me a big hug and said lets go get your check. Once I got my check, I felt a little better. I don't want you to think I'm heartless or anything, but getting that money seemed to be my reward for all the work I had put in to the project. People always told me that selling the first cow was always the hardest, but I found that every year I was always a little sad. I still loved showing dairy cattle, and I loved 4-H. I learned a lot about hard work and letting go, and I will always cherish the memories I made. It finally feels like we may actually be getting closer to spring! It's sunny outside, the weather is warm, and most importantly the fountains have been turned on. 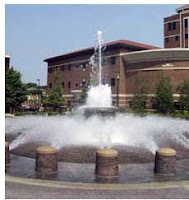 It may just be me, but it made me so happy when I walked out of class yesterday to see the fountains on! 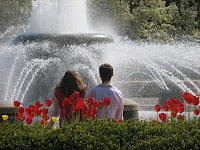 Every time there has been a warm day the last few weeks, my friends and I would discuss when we thought the fountains would be turned on again. I felt even though I know spring is coming soon, it never really seemed like it was ever going to get here because the fountains weren't on. Now when I walk by a fountain I see people sitting all around it studying and talking. Some people seem to just enjoy laying by the fountain and soaking up some sun. I've even seen a few kids playing tag around the fountain. Just seeing everyone else enjoy being outside puts me in a better mood. I never noticed how much I actually enjoyed the fountains until they were shut off for the winter. Having them on again reminds me there are only 3 weeks left until summer break. This means I only have a few weeks to get another fountain run in before I leave campus! During the summer, there is one major task that must be accomplished on our farm. We have to bale hay and straw. This may not sound like too big of a deal, but it is actually a lot of hard work. 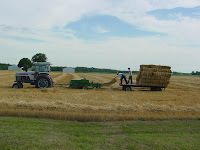 First of all, baling is usually done in the middle of the summer, which means it is extremely hot. Lifting heavy bales while being outside in 90 degree weather is no small task. In order to get all of our baling done in about a day and a half, we have to have a lot of people to help us out. There has to be at least two people on the wagon loading while one person drives the tractor and baler. We also have to have one person to transport full wagons to the barns and empty wagons back to the field. It usually takes about 6 more people to unload the wagons. I'm sure you can imagine that it can be rather difficult to round up ten people willing to suffer in the hot weather for a day and half. My dad would pay the workers, but let's face it, most people would rather be swimming doing something else to keep cool. I found out rather quickly that when my dad couldn't find enough people to help out, I would always "volunteer" to help. I believe I was about 14 the first time I "volunteered" for this task. Since I'm a girl, my strength wasn't really valued among the guys. Basically what I'm saying is I was going to get stuck doing some type of driving. Hauling the wagons back and forth would not be a bad job at all because I would have air-conditioning and radio; however, since I didn't have my drivers license, this small bit of hope was quickly taken away. I knew I was going to get stuck driving the tractor. I was really nervous about this task because I had never driven a tractor before. My sister went out with me the first day to try to give me a few pointers. As she was telling me all sorts of things, I started to panic. There was no way I would ever be able to remember all these things. 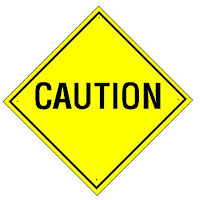 A few of th e most important rules are: always make right turns when pulling a baler and a wagon, let off the clutch slowly or else you will knock everyone off the wagon, don't get distracted and miss some straw, and watch out for holes. This is a lot of information to take in. I learned fairly quickly that actually driving the tractor is the easy part, but remembering all the little details is the hard part. Controlling the clutch is a hard skill to master because it usually sticks. This means it's almost impossible for someone that has small feel and that only weighs 115 pounds to be able to transition smoothly. The people on the wagon really don't like it when they almost get knocked off every time you start to go or come to a stop. My first day driving the baler alone was quite an experience. It was going pretty well. I hadn’t knocked anyone off the wagon or gotten the baler plugged up. Unfortunately my luck eventually ran out. Through the middle of our field there is a waterway. In the summer it’s dried out and it isn’t very steep, so we just have to drive across it while we’re baling. There is one part of the waterway that can be a little tricky to get to. It just so happened that when it came time to go through that part, I was pulling a wagon that was almost completely full of straw. I was so worried about making sure the wagon made it through the waterway ok that I wasn’t paying much attention to what was up ahead of me. What I didn’t see was a giant hole! I didn’t see it until the front of the tractor was about five inches from it. By that point there was nothing else I could do. I just had to go through it. I was absolutely terrified. My cousin and brother on the wagon started telling me to stop and I did. I felt so bad I almost started crying. My cousin came up to the tractor very calm and said he was going to try to get us out. Luckily he was able to get us out of the hole and none of the equipment was damaged. I feel very fortunate that my cousin was on the wagon that day. If it had just been my brother, I would have gotten majorly yelled at. My cousin had very good humor about it, and now looking back, even I can laugh about it. In the summer, it can be difficult to find fun, cool activities to do outside. Swimming is probably the most obvious activity, but after a while that can get a little old. Many people enjoy boating and skiing. I love to go whitewater rafting, but in Indiana it’s hard to find somewhere to raft that isn’t too far away. Another activity that is relatively easy to do in Indiana is canoeing. My first experience canoeing was quite interesting. One of my friends decided she wanted to take a few of us canoeing for her birthday. A few people turned into a rather large group. There ended up being enough people that we had to take 3 canoes. I was a little apprehensive about canoeing at first. I had never been before so I didn’t really know what to expect. I was really worried about tipping the canoe over, but once we got on the water, I felt much more comfortable. Canoeing actually turned out to be very relaxing. 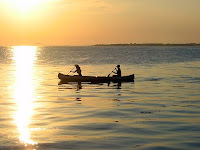 Since people usually canoe in calm water, there isn’t a lot of work to do while canoeing. The two major responsibilities are to paddle occasionally and steer clear of the shore. For the most part our group did a fairly good job of this; however, with three canoes full of teenage kids, there is bound to be some excitement. Two guys in one canoe decided they wanted to get out and swim. They were able to get out just fine, but getting back in the canoe was the problem. As they were trying to hoist themselves back into the boat, they accidently tipped it. Unfortunately, the place the boat tipped was very deep. They were half-heartedly trying to turn the boat right side up, but they couldn’t touch in the deep water. The boys thought it was funny, and the rest of us were sure the boat was going to sink. Once someone threatened the possibility of snakes in the water, the boys flipped the canoe right over and jumped in. I doubt there were any poisonous snakes, but it was a good enough threat to get them back in the boat. A little while later we came up on a long rope tied to a tree. We saw many people taking a break and swinging off the rope into the water. By that time the boys had forgotten all about the snake scare, and they were the first from our group to volunteer to swing into the water. Once the rest of us saw them use the swing and successfully make it into the water, we all decided we wanted to do it. We probably spent a half-hour at this particular spot just taking turns swinging into the water. I think everyone that went canoeing that day had a really great time. The great thing about canoeing is you can take your time and just relax. There isn’t a lot of danger or many things to worry about. It’s a great way to be outside even in the hottest weather and still stay cool. Two Cows and a Goat? I’ve seen some crazy things growing up on a farm. One of the oddest things I’ve seen happened one night this past summer. I woke up around 2 o’clock in the morning because I heard a man’s voice talking. I realized right away it wasn’t my dad or my brother. I was quite alarmed at first, but then I heard my talking to this man. Once I realized that everything was ok, I tried to figure out who would show up at our house at 2 o’clock in the morning. The only person I’d every known to come to house in the middle of the night was the sheriff. I know this sounds alarming, but if we have cows that get out or something during the night, the sheriff will come by and tell my dad. He usually even sticks around and helps my dad get the cows back to where they belong. After I thought of this, I figured we just had some cows out and there was nothing to worry about. So, I fell right back to sleep without giving the issue any more thought. When I woke up in the morning, I asked my mom about the situation. She told me that we actually didn’t have any cows out. Apparently there were two beef cows and a goat out roaming around. A neighbor and the sheriff were taking them around to people they thought they might own these animals. My dad told them we didn’t have that type of cows and we most definitely didn’t have any goats. I found the whole situation a little humorous. Not every day does the sheriff come to your door asking if you lost two cows and a goat. My parents and I joked about it a little, but by the afternoon we had sort of forgotten about it. That evening we went out to eat, and when we got back from eating, we noticed there were two cows in our pasture that didn’t match the rest. Yes. The two homeless cows had somehow gotten into our pasture. Needless to say we were all a little surprised. The next thought that crossed our mind was if the goat was also wondering around somewhere. 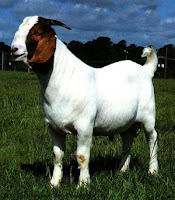 Sure enough the goat had found its way into one of our barns. My dad really didn’t know what to do. At first he thought maybe the sheriff and our neighbor had just left them at our house because they couldn’t find the correct owners, but that turned out to not be the case. These animals had just found their way back to our hose. The next day we were debating on what we should do with them. Honestly my dad had no idea what to do with them. A strange truck came up our drive with a trailer attached. They came up and talked to my dad for a while. They mentioned they had lost two cows and wondered if my dad had seen them. Then my dad asked if they by any chance lost something else too. This really made them happy. They said they also lost their daughter’s pet goat, but they figured it wouldn’t still be with the cows. Luckily everything worked out and the animals were returned to their rightful owner. I’ve seen a lot of different things, but this definitely topped my list. Even to this day, it still makes me laugh a little. Dogs are my favorite animals. My family has had a number of dogs over the years, and I've loved all of them. Growing up I always wanted a dog that could be in the house. Since we lived on a farm and our dogs were always getting dirty, my parents never let us have any pets in the house. My junior year in high school we got a new puppy. 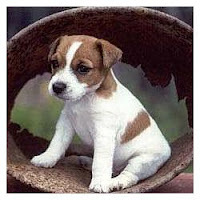 She was a Jack Russell Terrier. I had never really been a big fan of little dogs because we always had rather big dogs; however, something about this litter of Jack Russells caught my eye. 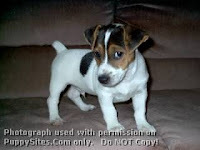 I also knew that if I got a smaller dog, there was a good chance my parents would let me keep it in the house. There was one particular pup that I really liked. She had more spots than the rest of the puppies and she was very fiesty. She was always growling and wrestling around. I chose her because she seemed like she would be the most fun. What I didn't know was that I was in for quite an adventure. The first thing I do when I get a new animal is try to pick a name. Sometimes it's hard to choose a name before you actually get to know the animal's personality. I was having a really hard time trying to pick a name for my new puppy. She was very active and she was mean most of the time. The only time I could really get close to her was while she was sleeping. After a couple weeks a name finally came to me. I decided to name her after a character in one of my favorite books. My favorite book is To Kill a Mockingbird. The character I chose to name my puppy after was Scout. I chose t his character because she is a tough little girl that likes to fight. This name turned out to fit my puppy perfectly. Scout would attack my feet every time I sat in a chair. When I walked through a room she would bite my pant legs and I would have to drag her several feet before she let go. She also would destroy anything in sight. We had to keep everything away from her. After the first few weeks I was worried she would never out grow this awful puppy stage. Scout did eventually grew out of her puppy stage, and she has turned out to be a really great dog. Scout plays fetch like it's her job. Even if she is completely asleep but she hears her ball bouncing across the floor, she will jump up and bring it back. She doesn't really chew things she isn't supposed to anymore, but if you give her a toy, she usually has it destroyed in about five minutes. One of the funniest things about her is that she notices the T.V. If a dog or any other animal appears on the screen, she runs up to the T.V. and barks at it until the animal is not longer on the screen. I assumed she would also outgrow this too, but it seems she only notices more and more all the time. Scout has turned out to be one of the best dogs anyone could ask for. It's hard to thing that during her terribe puppy stage we considered getting rid of her. Luckily we decided to keep her and it all paid off. Now she is a lot calmer and lovable, but she is always willing to play. In my opinion, that is the perfect combination. I have recently moved to the city. I grew up on a dairy farm out in the country. I was surrounded by fields trees, and of course cows. As you can imagine, moving to the city was quite a shock. I decided to write about many of my experiences from living in the country because there are a lot of things you just can't do in the city.